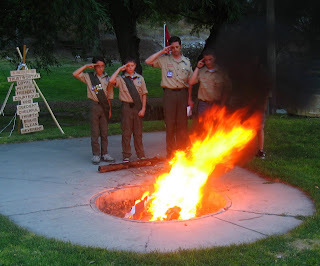 I had never seen this done before, but last night at Scout Court of Honor the troop burned an old tattered flag. It was done properly and very systematically. I was very impressed with the nature of how this was handled. We were told to stand and put our hand over our heart and to be silent. Even restless little Andy held still and quietly watched in awe. The flag was fairly large and once it began to burn, burned quickly. We repeated the pledge of allegiance and then listened as the troop leader read something about the flag. It was something I will never forget. I'm sure it left an impression on Mason as well.